U.S. Rep. Roger Williams said he dove for the dugout as a gunman began shooting Wednesday morning during a GOP congressional baseball practice in Virginia. U.S. Rep. Steve Scalise and one of Williams' staffers were among those shot. ALEXANDRIA, Virginia — A staffer of U.S. Rep. Roger Williams, who was among those shot at a congressional baseball practice Wednesday morning, is expected to make a full recovery, the Austin Republican said. There were four Texas lawmakers on the Republican team – U.S. Reps Joe Barton, Kevin Brady, Mike Conaway and Williams – that attended the practice. None were shot. "Congressman Williams was not shot, however a member of his staff was shot and is receiving medical attention," his office said in a statement shortly after the shooting. Williams said the staffer, Zack Barth, is doing well and is expected to make a full recovery. 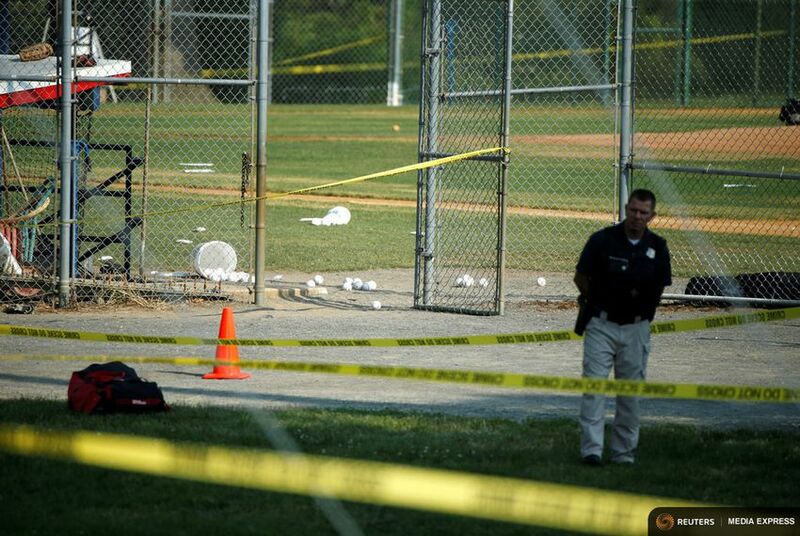 A gunman fired on members of Congress practicing baseball Wednesday morning. U.S. Rep. Steve Scalise, R-Louisiana, was also among those shot. Scalise underwent surgery for a gunshot wound to the hip and was in critical condition Wednesday afternoon, according to news reports. In addition to Barth and Scalise, two Capitol Hill police officers were also shot. A Capitol Hill police chief said the officers are in good condition. In a televised address, President Donald Trump said that the shooter, identified by multiple news outlets as James Hodgkinson, 66, of Illinois, died from his injuries in the shooting. Williams told the Tribune on Wednesday afternoon that he was hitting ground balls to Scalise at second base when the commotion started. He dove for the dugout and "tore up" his leg and ankle. Inside there, members crowded around Barton's young son to protect him. And that's when Williams realized his own staffer, Zack Barth, was among those shot. "Then all of the sudden one of my directors in my office – he got shot and he came hauling into the dugout and fell into my arms and we were both hugging each other," Williams said. U.S. Sen. Jeff Flake, R-Arizona, offered aid to Barth. "Jeff Flake got his belt off and put a tourniquet on his leg and stopped the bleeding," Williams said. Williams said Barth will be fine, and the hospital discharged him on Wednesday. The shooter attempted to gain access to the field, but a locked fence restricted his access. Scalise is the third-ranking Republican in the U.S. House. As such, he has a constant U.S. Capitol Police detail. Williams, like so many others Wednesday, credited those officers for preventing a massacre. "Capitol Police came and they took a step forward and not a step back," Williams said. "I’m ... thankful to God for keeping us safe with the bravery of these Capitol Police." "The Alexandria Police along with the Capital Police secured a cease-fire, capturing the suspect," Barton said. The entire exchange lasted around 10 minutes. Across the Potomac, U.S. Rep. Marc Veasey of Fort Worth was the lone Texan practicing on the Democratic team. They were onto their third player taking batting practice when their coach, U.S. Rep. Mike Doyle of Pennsylvania, called them into the dugout for a grim announcement. "As soon as Doyle got done talking, I don’t remember what member it was, said, 'Hey guys, they’re saying Steve Scalise was shot,'" Veasey recalled. "And then it got really serious." A Capitol policeman on duty had the Democratic ballplayers stay in their dugout until a SWAT team arrived to secure the premises. At a mid-morning press conference, law enforcement officials said it was too early to comment on a number of aspects of the shooting, including whether the lawmakers were targeted. Williams, a former minor-league baseball player, has coached the GOP Congressional team since 2013, according to his office. Amid news of the shooting, House members were alerted that that no votes were expected in that chamber Wednesday. Several committee hearings were postponed. Both U.S. House Speaker Paul Ryan and House Minority Leader Nancy Pelosi spoke briefly on the House floor, recognizing the bravery of the Capitol police and calling for unity. "We are all imperfect, but we do not shed our humanity when we enter this chamber," Ryan said. "For all the noise and all the fury, we are one family." Statements from Texas lawmakers on Wednesday expressed prayers for those who were shot and praise for Capitol Hill police for their response. "We are all Americans, and we must stand together against any attempt to divide us," U.S. Rep. Kay Granger, R- Fort Worth, said in a statement. U.S. Rep. Marc Veasey of Fort Worth, the lone Texan on the Democrats' congressional baseball team, tweeted his support and prayers after news of the shooting came out. The shooting drew reactions from several statewide officials, who said they were keeping the victims in their thoughts and prayers. Lt. Gov. Dan Patrick issued a statement condemning the shooting, saying, "This hatred and violence has no place in America — it flies in the face of the very democracy our nation is rooted in." The Congressional Baseball Game is the pinnacle event of the summer among Washington and Capitol Hill insiders. For over 100 years, Democrats and Republicans in Congress have played against one another. Members from both teams practice for weeks ahead of time, rising before sunrise to hit the diamond around 6:30 a.m. While Republicans practice at a park in Alexandria, Democrats practice closer to the Capitol, at a college in Northeast Washington, D.C.
Thursday's game will be held at Nationals Park, where the Washington Nationals play. Patrick Svitek and Kirby Wilson contributed to this report.